Round fried, filled donuts are very popular in Poland- we even have a special donut day which is officially called: ‘Fat Thursday’. American ring doughnuts are less common in my country and most people associate them with a stereotypical American Police Officer who’ll be characterised with a doughnut in one hand and coffee in the other. I saw so many amazing and colourful pictures of doughnuts on Instagram that I couldn’t resist having a go at making some myself! To cut down a little bit on fat and calories, I decided to make baked doughnuts rather than fried. 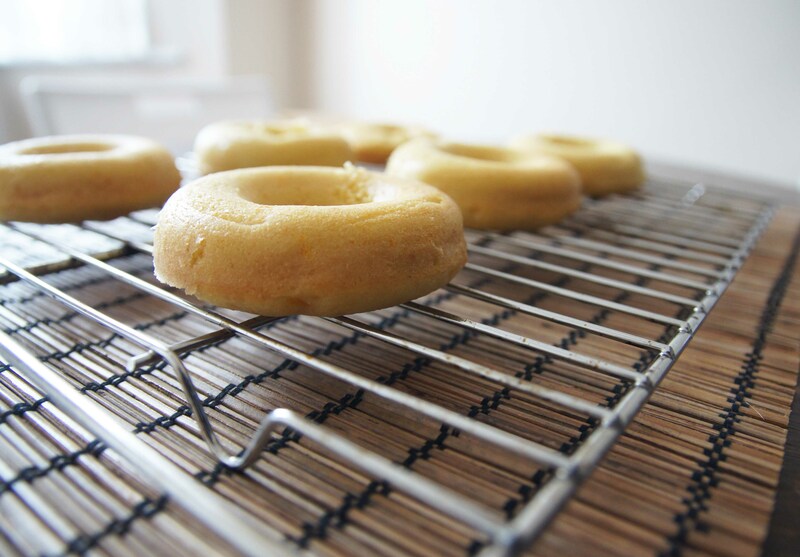 After a short search on Amazon I’ve ordered my first donut baking tray. I reckon this will definitely be money well spent. 1.Pre heat the oven to 180˚C. 2.In a large bowl combine flour, sugar, baking powder and soda. 4.Add dry ingredients to wet ingredients and beat until well combined. 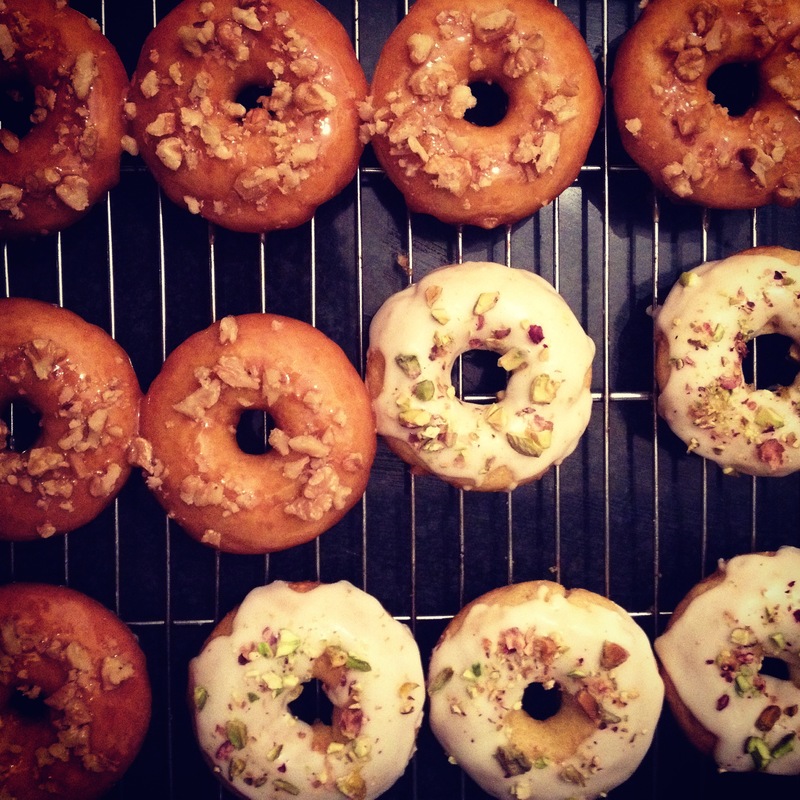 6.Remove the donuts from the oven and let them cool down. 1.In a small saucepan heat the butter, sugar and salt over medium heat until it comes to a boil. 2.Once sugar and butter combined add cream and icing sugar. Stir and let the caramel boil for a minute. 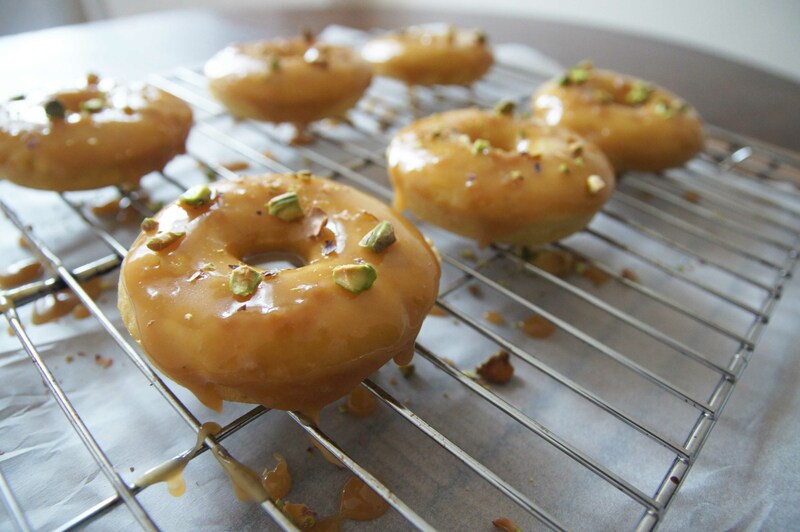 3.Dip the tops of the doughnuts into the caramel and garnish with pistachio or walnuts.